First Flight’s Katherine Schuster scorched the field at Foxfire Golf Club and Resort to claim her second straight NCHSAA 1A/2A Womens Golf Individual State Championship. 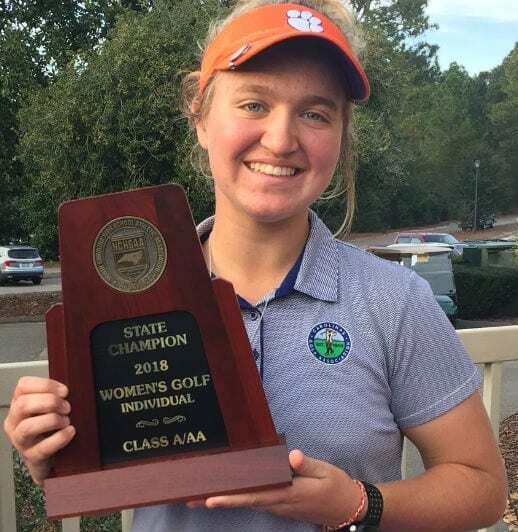 The sophomore from Kill Devil Hills won the tournament by four shots over Mallory Fobes of Forbush, posting rounds of 68 and 71 on the 5,256 yards Grey Fox Course near Pinehurst. Currituck senior Bailee Twiford finished third for a second consecutive year, after besting Schuster at last week’s East Regional in Goldsboro by one shot. Schuster added to her amazing resume Tuesday, after winning the Drive, Chip and Putt girls 14-15 National Championship in April at Augusta National Golf Club, where she sank a 30-foot putt on the storied 18th green to clinch the title. She has overcome a battle with Multiple Hereditary Exstosis, including multiple surgeries to remove bone spurs, and played in the first-ever DCP National Championship in 2015, finishing third in the 11-12 division. First Flight High School athletes have won individual state championships in each of the last four school years.